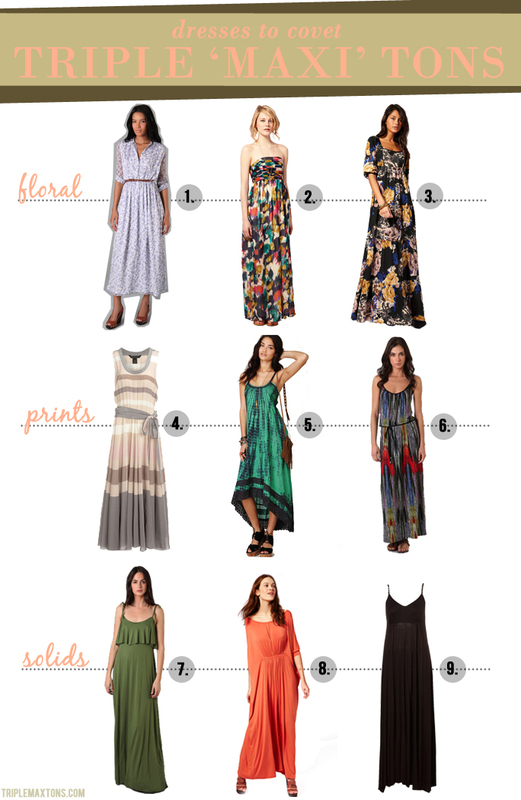 Now, if there is one 'trend' that I have loved ever since their sweeping hems graced the runways, it is the maxi dress. Aside from the splurge-tastic Marc Jacobs striped frock, all of the dresses that made the list are perfectly attainable...and some are on sale just in time for the summer wardrobe revamp! To all the little shrimps out there - don't say you can't rock this trend. You can, I promise! Just go grab your highest wedges (or God forbid, a FLATFORM), some hem tape, and get 'er done. To all the lady giraffes out there, pull those shoulders back and gallop forward with the pride of knowing this is the one trend you can pull off with ease. PS THANK YOU TO ALL MY NEW FOLLOWERS! To quote my mom-in-law, "You are the wind beneath my wings." Really....you all ROCK. love maxi dresses...they make you feel so good.dressed but relaxed. here here to maxis!